Since the discovery in 1986 of high-temperature superconductivity in layered cuprates, the secrets of this remarkable phenomenon have steadily emerged. From the time of the earliest reports, it has been well recognized that the superconducting transition temperature is highly sensitive to the level of chemical doping, a necessary prerequisite to attaining the superconducting state in these materials. As a method of investigating the fundamental changes in physical properties characteristic of the superconducting state, however, doping is a rather coarse probe because a continuous variation in dopant concentration is difficult to achieve. Tanja Cuk, then a graduate student at Stanford University, together with colleagues from Carnegie, the University of Waterloo, the Naval Research Laboratory, and the Nanoelectronics Research Institute (Japan) found for the first time that in addition to chemical manipulation, the superconducting state can be induced by applied pressure in high temperature, cuprate superconductors, as it has been for low-temperature, elemental superconductors. Using the Raman spectroscopy laboratory at Carnegie and the high-pressure synchrotron x-ray beamline at HPCAT, both CDAC-supported facilities, Cuk and colleagues have applied a unique combination of contact-free experimental techniques toward investigating the effects of pressure on superconducting properties. A slightly doped, non-superconducting sample of the insulating parent material Bi1.98Sr2.06Y0.68Cu2O8+δ shows anomalies in electronic Raman background, electron-phonon coupling λ, spectral weight transfer, density dependent behaviour of phonons and magnons, and c-axis compressibility with pressure at 21 GPa, which are directly related to the changes in physical properties observed in the material at the critical doping level. 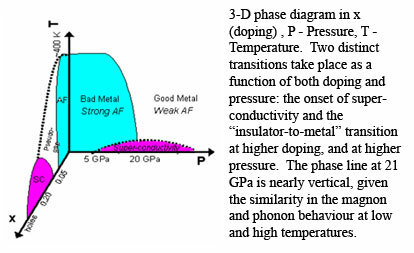 The results suggest that compression along the c-axis brings CuO2 layers closer together and leads to increased hole-doping to the optimal level, which would lead to the onset of superconductivity at the appropriate temperature.